A Complete Computer Based Math Curriculum - "From Counting to Calculus" A Complete Computer Based Instructional Math Software for the Classroom Curriculum or the Home school Curriculum"
Home > A Complete Computer Based Math Curriculum - "From Counting to Calculus"
A Complete Computer Based Math Curriculum - "From Counting to Calculus"
Instructional Math Software for the Classroom or the Home school Curriculum. (2) Needs reinforcement or just doesn’t "get it"
Each topic is first introduced with one or more screens of definitions and examples. Students interact with each question. Questions offer HINTs and step-by-step explanations for both the correct and incorrect responses. Beginning students practice facts, then move on to the task of learning the detailed steps of the mechanics of arithmetic with problem solving scattered throughout. Students work at the computer and with auxillary worksheets which accompany the software. More advanced students work the problems with paper and pencil themselves and check the steps with the computer -- taking as many steps from the explanation as they need to complete the problem. At any point in the explanation process, the student may return to the question and enter their answer to check its correctness. The explanations are the "heart and soul" of the programs -- with details and branching opportunities if students do not know the pre-requisite math. Moving back and forth, in and out of problems and explanations is done with ease. Click and go anywhere at any time. Each MathMedia program contains assessments which may be used as pre-tests to assess strengths and weaknesses or as a post-tests to assess understanding of the topic just studied. 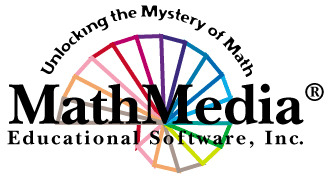 To the delight of both teachers and students, MathMedia has delicately interwoven computer-delivered instruction with computer-delivered assessments. In the "Arithmetic Series", "Basic Math Series", and "Reading and Critical Thinking - Level 1" student data is automatically recorded. More advanced students use the assessments as learning tools, studying the solutions along the way.